Los Angeles, CA – February 22, 2018 – The award-winning documentary about the worldwide Kirtan (chanting) movement, MANTRA – Sounds into Silence will be premiering in New York City on March 16, followed by runs in Los Angeles starting April 6, and Boulder starting April 18. The film is also now available via Gathr‘s Theatrical on Demand® platform for US screenings starting April 24. 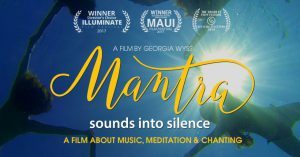 A feature-length documentary, exploring the growing musical and social phenomenon of chanting, MANTRA – Sounds into Silence shares the stories of people who are finding healing and a sense of inner peace by singing mantras together. It’s a film about spirituality not religion, about people reconnecting with their true selves and with others. As our characters’ stories about their connection to the music unfold, we meet the musicians who have inspired them and brought them together. Through these encounters, we will discover how Deva Premal & Miten with Manose, Krishna Das, Snatam Kaur, Jai Uttal, Dave Stringer, Lama Gyurme & Jean-Philippe Rykiel, MC Yogi, C.C. White, Nina Rao, Mirabai Ceiba, Gaura Vani, Charlie Braun, Guru Ganesha, Wah! and others came to this music themselves and to the practice of Kirtan, and how, over the years, it transformed their lives as well. Other notable experts who appear in the film include: Sharon Gannon, Co-founder, Jivamukti Yoga School, Anand Semaltry, Brahmin & Vedic Astrologer, Stephan Rechtschaffen, MD, Co-Founder Blue Spirit, Costa Rica & Omega Institute, Andrew Newberg, MD, Director of Research, Marcus Institute of Integrative Health, Elizabeth Leuthner, Hope Acts Program, Manager, Jill Purce, Sound Healing Pioneer, Susan Shannon, Buddhist Minister, San Quentin State Prison and more. For those unfamiliar with Kirtan – it is a participatory, call and response form of singing that is becoming increasingly popular throughout the world as westerners discover its uplifting and healing effects. Kirtan is not in any way religious but many do describe it as spiritual. At a Kirtan event, the lines between musician and audience are blurred: the audience members play a vital role in the music through their singing in response to the “call” of the artist. It is now so popular that several artists have been nominated for and won Grammy awards. The New York City premiere and run will take place at The Rubin Museum Theater. The Rubin Museum of Art is dedicated to the collection, display, and preservation of the art and cultures of the Himalayas, India and neighboring regions. They recently hosted another successful Gathr spiritual release, Walk With Me, a documentary about the world-famous Buddhist teacher Thich Nhat Hanh. MANTRA – Sounds into Silence will premier March 16 followed by a two-week run. The New York run will feature post film Q&As by noted Kirtan artists Charlie Braun (3/16), Gaura Vani (3/17), Nina Rao (3/18), Krisha Das (3/21), Lily Cushman (3/22), Scott Whitmore (3/24), AMBIKA (3/25). They will also lead the audience in a post-film Kirtan experience. The week-long Los Angeles run will begin at the Santa Monica Laemmle Theater on April 6. The first screening will include a Q&A with the director. Kirtan artists to appear on this run will be announced soon. A week-long run has also been booked in Boulder, Colorado from April 18-24 at the Dairy Arts Theater. Boulder is something of a spiritual hotbed due to being the home of a Buddhist college, Naropa University, and its stunning natural beauty. For other US screenings the Mantra team is working with Gathr Films, the creator of Theatrical On Demand® releasing. Theatrical On Demand® allows individuals the opportunity to organize and promote film screenings in movie theaters across the country. With Theatrical On Demand®, fans can bring the films they want to see play in their local movie theater. It is so easy! Fans, called Movie Captains, just pick the date, time, and theater where they want to host their screening. Gathr Films will set everything up. It doesn’t cost Movie Captains anything to host a Theatrical On Demand® screening. Movie Captains don’t have to pay any screening room rental or exhibition fee. All they have to do is promote the film and get people to reserve tickets. MANTRA – Sounds into Silence was directed by Barcelona based filmmaker Georgia Wyss. Her other recent work includes co-producing/co-writing/editing the documentary No Plorar Mai (Never to Cry) for the Spanish station TV3; editing The Lightbulb Conspiracy – winner of Best Documentary at the Spanish Television Academy Awards, and A Crude Awakening, a feature documentary shown at over 70 film festivals and winner of 5 awards for best documentary. Earlier in her career Georgia focused on music documentaries for VH1 and MTV, including the series “Where Are They Now,” Aretha Franklin’s “The Legends,” and EPKs for Tina Turner, and Paul McCartney’s “Back in the World” tour, and much more. The film was produced by Raymond McCormack and Georgia, who have a creative partnership together, stretching back more than a decade. With a background in music – having collaborated with leading artists like Sir Paul McCartney and Queen – Raymond made his feature producing debut with Welcome to the Cheap Seats, an award-winning documentary on UK post-punk outfit, The Wonder Stuff. He is also an award-winning director, in his own right, for the Netflix staple, A Crude Awakening. and then accommodates and books those requests in local theaters and non-theatrical venues.